The American Civil Liberties Union of Iowa and the Wisconsin-based Freedom from Religion Foundation are considering a lawsuit to block a proclamation signed in April by Gov. 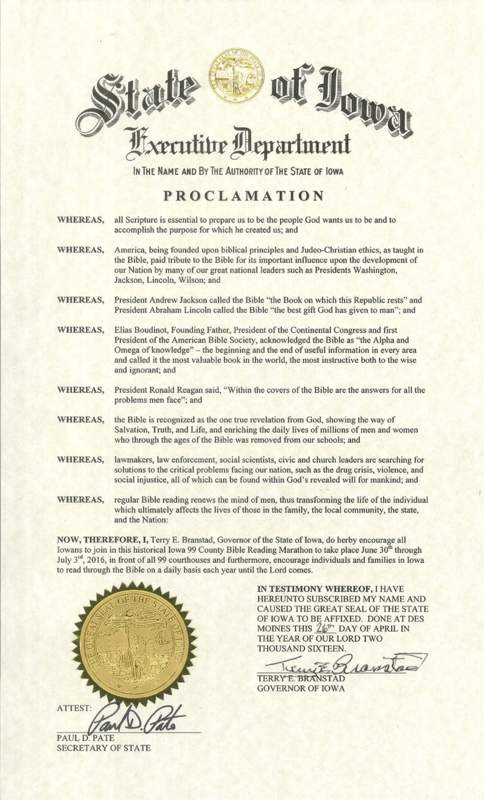 Terry Branstad to encourage Iowans to take part in a “99 County Bible Reading Marathon” outside courthouses from June 30 to July 3 and to read their Bibles until the second coming of Jesus Christ. Two of the groups organizing Branstad’s Bible Reading Marathon are the United States National Prayer Council and the Iowa Legislative Prayer Caucus, the latter of which is co-chaired by two Republicans, state Sen. Jason Schultz and state Rep. Joel Fry, and Democratic state Rep. Phyllis Thede.